Over 100,000 users worldwide and counting. 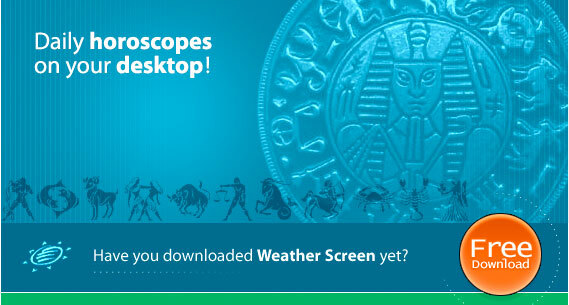 free daily horoscopes, biorhythm calculator, Web cams, and weather maps to your desktop. The modern society is divided into two equally represented groups: those who believe in horoscopes and other supernatural phenomena and those who angrily deny them as superstitions. We surveyed 2,000 users odd and 47% of them confirmed they believed in horoscopes, yet the rest of users (roughly 53%) said a firm “NO” to astrology. The fun of it is that 94% of the surveyed said they regularly read the daily horoscopes for their signs. On the Fool’s Day we made another survey: Who or what do you trust more: (a) politicians, (b) horoscopes. The Politicians lost to the Horoscopes by a score of 99-1 and were eliminated from the playoffs. You're back in the kind of situation that frustrates you. Someone is taking advantage of your generous nature, and you can't quite tell them to take a hike. Assert yourself now and change the situation. Wish everyone well as you go your own way. If you seem to be fleeing, it's only because you're running toward something else. Embrace new people as if you're at home everywhere you go.